It’s nice to know that after the hustle and bustle of preparing for Christmas intermixed with the Sundays where we are expectantly waiting with joy of anticipation, that after the big day—- it’s not over. In the 12 days following Christmas day we have time to reflect and give thanks each day for a particular gift that God has given us. I am speaking of the 12 days of Christmas, but not necessarily of geese-a-laying or maids-a-milking. Today we teach our children the ABC’s with things like A is apple, b for banana and c is for cat. It is referred to as memorization by association. Many years ago the Catholic Church taught their children and new converts a way to remember and give thanks to God for the gifts of the tenements of the faith of Christianity. Some even say it was a secret code as the church was enduring persecution. What we know today as the song of The Twelve Days of Christmas was once a poem, and the poem became a song which without explanation became a silly song of a lover bestowing lavish gifts on his loved one. I have even heard of some who have added up the cost of all the gifts mentioned and it was astronomical. However this isn’t far off from the truth of the meaning of the song. The partridge in the pear tree is Jesus the Son of God. The partridge is a ground bird who will cover her young and die to protect them. A good picture of Jesus who covered our sin by dying for us on a tree. Two turtle doves speaks of the two testaments of God’s Word, the Bible. The Old and The New tell us of God’s plan and is there for all who will read and believe. Turtle doves were used by the poor as a sacrifice when they could not afford a lamb. Three French Hens were used to describe the three virtues of Faith, Hope, and Love, taught in I Corinthians ch 13. French hens are said to be a very quiet, gentle and friendly hen. Four calling birds are the four gospels calling out the Good News of the gospel of Jesus Christ. Five Golden Rings are the first five foundational books of the Bible, known as the five books of the Torah. These books give the history of humanity’s sinful nature and of God’s response of grace to create a people who would bring forth a light to the world. Six geese a-laying speak of the six days of creation, each egg representing a day that something new was made by the Creator and Sustainer of the world. Seven swans a-swimming are the seven gifts of the Spirit found in II Cor 12:8-11 and Romans 12:6-6, an appropriate symbol for these gifts of grace as swans are considered among the most beautiful and graceful creatures on earth. Nine ladies dancing are the nine fruits of the Spirit found in Galatians 5:22. Dancing denotes joy as does a life that produces these fruits from the Holy Spirit. Ten lords a-leaping are the Ten Commandments. In the day of Lords and servants, the lord was the judge and jury not always dealing justly. The ten commandments give a clear understanding of right and wrong. Eleven Pipers piping refer to the eleven faithful apostles, the disciples who followed Jesus after His death and resurrection. The twelfth apostle stopped following Christ just before His death. Twelve drummers drumming are the twelve points of doctrine in the Apostle’s creed which is repeated over and over like drumming these points into our being. 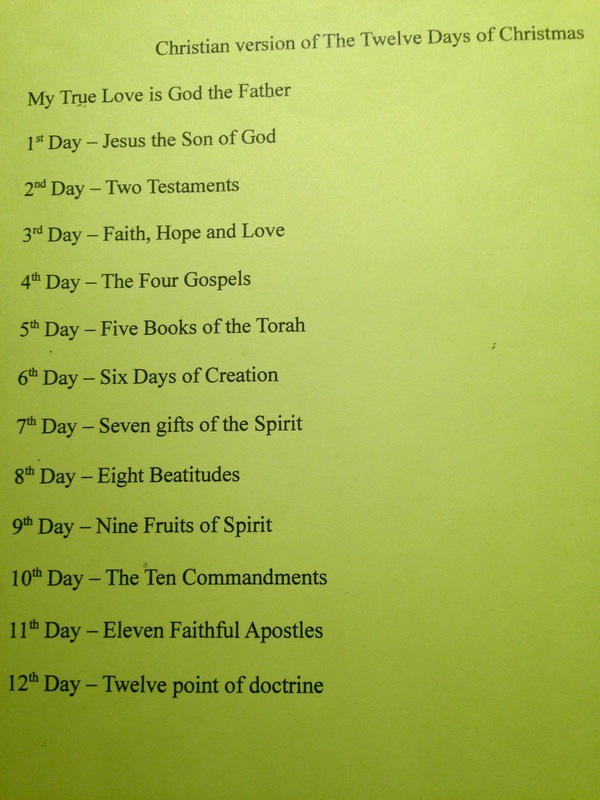 Using these phrases you can sing This version of The Twelve Days of Christmas. Try it, you’ll like it. There are several other versions like the Polish dinner, and the Hawaiian version, but this is version is the true meaning of the Twelve days and I for one think it should be sung as well. This is the third celebration of Christmas, there is one more and I will post it before the end of the twelve days of Christmas. In the meantime thank God for the designated gift each of the twelve days.